Wyck is a historic house and garden in Philadelphia that today provides cultural preservation and interpretation of this National Historic Landmark. The website describes the organization’s history and its many programs and resources. Wyck originally asked for help changing their site’s WordPress template, but after conducting a site analysis and interviewing Wyck's Director to understand her goals for the website, I recommended that we first evaluate the site's information architecture. The existing site contained a great deal of information, but was a bit unorganized, the written content was dry and dense, and important events and programs were insufficiently showcased. To determine a stronger focus and more cogent categorizations of the site's pages, I asked volunteers to sort index cards, and to imagine the first 3 things they would try to find out on the site. I also examined the websites of comparable American historic houses and museums. 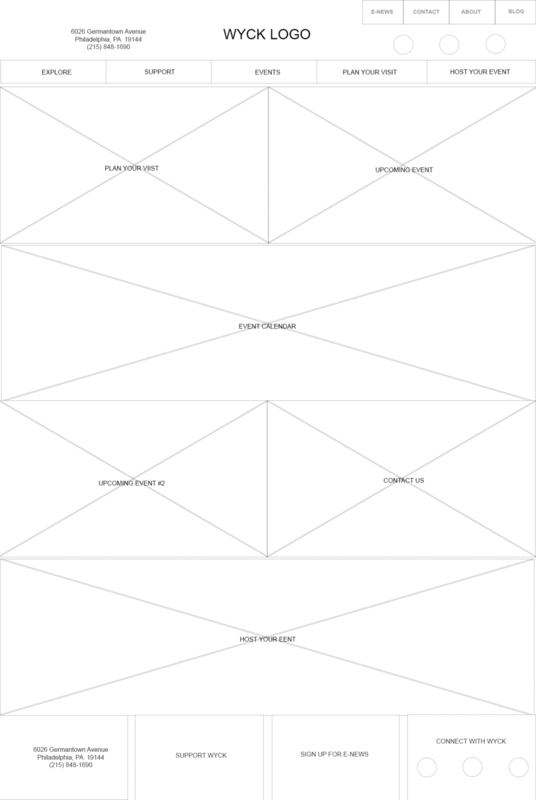 I created a site map, wireframes, and prototypes to present a new navigation and homepage layout.